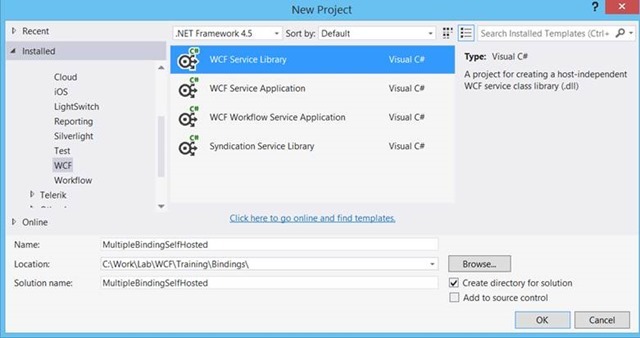 To start with create a project by choosing either WCF Service Application or WCF Service Library from the WCF tab. I am selecting WCF Service Library project template. By this step we have created the service and implemented it. Compile the solution to make sure that everything is fine in the WCF project. Great, by this step we have added Endpoint with the netTcpBinding. Next let us go ahead and create instance of the service host by passing service definition class in the constructor. Add new Endpoint as follows. If you notice I have given name to the Endpoint as httpendpoint. You are free to give name of your choice. Also make sure that you have given a name to netTcpBinding Endpoint as well. Next let us go ahead and add metadata endpoint for http binding as well. We have successfully created a self-hosted service with multiple Endpoint. Now let us go ahead and create a client to consume the service. In console application, right click and add service reference. 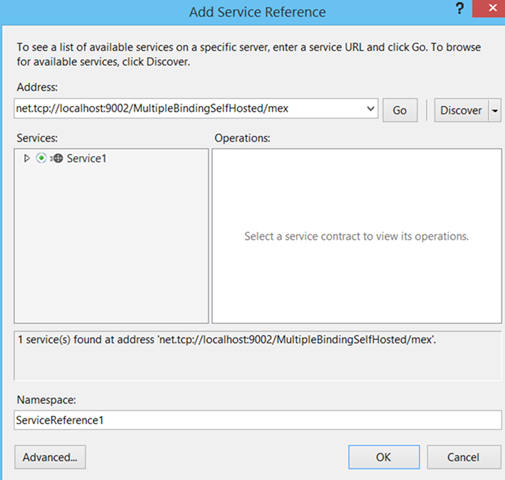 If client is in the same solution then use Discover option else copy paste base address from app.config file of the hosted application. In this way you can create the self-hosted WCF service with multiple Endpoints. I hope this post is useful. Happy Coding!